In 1969, the Fred Bauer Chevrolet dealership in Portland, Ore., was very happy to accept a $100 deposit from steady customer Hal Miller. During the early 1960s, Miller had regularly purchased each new Chevrolet model as soon as it became available, such as the Chevy II and Chevelle. 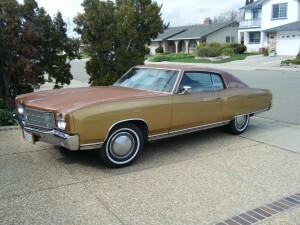 “I had heard that General Motors would produce a new model called the `Monte Carlo’,” Miller recalls. At the time Miller was a commercial navigator/pilot flying overseas and was unable to see a sneak preview of what the new 1970 Monte Carlo might look like. On the Monte Carlo that he ordered Miller specified 18 optional extras including: floor mats, tinted glass, fender skirts, rear defogger, power steering, center console, rear-seat speaker, custom seatbelts, visor vanity mirror, AM push-button radio, remote exterior mirror, Strato-bucket front seats, comfort tilt steering wheel, four season air conditioner, evaporative emission control, Turbo-Fire 350-cubic-inch V-8, two-speed Power Glide transmission, and G78x15-inch belted white sidewall tires. When he took delivery of the car Miller had to pony up the remaining $3,810 due. 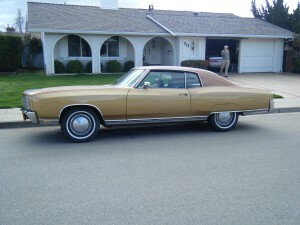 He then drove off in his new 3,460-pound Monte Carlo on a 116-inch wheelbase to his Livermore, Calif., home. From that day four decades ago to the present day, Miller says his 1970 Monte Carlo, one of 130,657 built, has been remarkable. Of course, Miller always regularly rotated the tires. “I don’t think I’ve ever had the spare tire out of the trunk,” he says. The car has been driven all over the western part of the United States. Miller says that across Nevada, North Dakota and Montana his car will run all day between 85 and 90 mph. Miller remembers the singular blemish on the Monte Carlo’s record came when another motorist did some minor cosmetic damage to his left front fender. The Autumn Gold paint has been resprayed twice, but the saddle-colored vinyl interior remains original. When the Monte Carlo had been driven 190,000 miles Miller asked a mechanically talented friend if he would replace the lifters, timing gear and chain. The mechanic called Miller later to say he could not believe the condition of the bearings and cylinder walls. “I replied that there was no way that he should be seeing those things if he was doing what I had asked him to do.” The mechanic said he was sure that the engine needed more attention, but was convinced by Miller to put everything back in its place. The odometer on Miller’s Monte Carlo is now approaching 400,000 miles and the car is still running strong. “I would probably have higher miles on it if I drove it more often,” he says.